…businesses will require people who can share information and talents. I think this is especially true as we move from top-down hierarchical models to broader, flatter organizations. Customers also will fuel this change, since they require quick actions and decisions, and expect an organization to be able to create products and solve problems across organizational boundaries. In fact, some organizations are beginning to place great weight on teamwork: Phillips tells readers that "Cisco, a firm known for fast growth, has made 'teamwork and collaboration' a factor in its formula for computing management bonuses. This factor alone can have impact bonuses as much as 20%." Companies wishing to hone or gain that competitive edge may want to think about offering conflict resolution and mutual gains training to management and staff to build the capacity for effective teamwork. Joel Schoenmeyer over at the excellent Death and Taxes blog is in the process of gathering together estate planning and probate related mediation resources (mostly online). This is an opus in four acts. You can check out Part 1 and Part 2 of Joel's work in progress. Coming soon: Parts 3 and 4, which will provide links to web sites relating to probate mediation, and links to mediation and ADR-related web sites and blogs, respectively. I’m looking forward in particular to Joel's compilation of ADR-related blogs--I conducted my own survey last year and had been planning to update my results within the next several weeks, since there have been some additions to the ADR blog world since then. It looks like Joel may save me the time. Even for dispute resolution professionals, dealing with conflict can be tough. It can be especially difficult to resist the tendency to second-guess ourselves. Long after the conflict has ended, we continue to hit the instant replay button: Did I say the right thing? Did I overreact? Why did I let myself get so emotional? Tammy Lenski has written two rock-solid posts for anyone who has struggled with their own responses to conflict and who seeks to learn more effective modes of behavior: “Using Your ‘Right Voice’ in Conflict” and “Beware the Conflict Replay”. Take a message: the rise of call center mediators? In these modern times, mediation is no longer conducted solely through face-to-face meetings with parties. Pioneering mediators have increasingly used digital technology, e-mail, and telephone to support or replace face-to-face interactions. Geoff Sharp, riffing on a recent post of mine on the rise of law in cyberspace, blogged this week about two changes on the ADR scene in New Zealand: 1) the establishment by the New Zealand Office of the Domain Name Commissioner of a panel of cyber-mediators charged with the resolution of .nz domain name disputes, and 2) a push by another New Zealand government agency to implement the use of telephone mediation to resolve disputes between landlords and tenants. Strategic conversations: a talk with an online dispute resolution pioneer. Speaking of the brave new world of online dispute resolution, Negotiating Tip of the Week features an interview with Colin Rule, the Director of Dispute Resolution at eBay, about the differences between resolving disputes online or in the flesh. 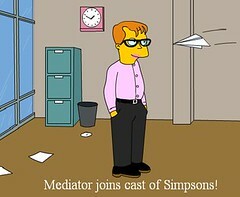 Identity crisis: what exactly is this mediation stuff anyway? With the rapid proliferation of so many different types of alternative dispute resolution processes, there’s understandably much confusion, even within the mediation field itself, about what mediation is anyway and just how do we define it. Florida Mediator Perry Itkin looks at the confusion in "If It Looks, Walks And Quacks Like A Duck – It’s Not Mediation! It’s A Duck!" Warning: this concluding story has nothing whatsoever to do with alternative dispute resolution, negotiation, collaborative processes, or the law. If you prefer your mediation blogs straight up, please feel free to skip this one. Via Professor Bainbridge comes news of the SimpsoMaker, allowing you to transform yourself into a Simpsons character, just in time for the weekend.